A summery pie reminiscent of the classic peanut butter and jelly sandwich, this recipe is no bake and gluten free! 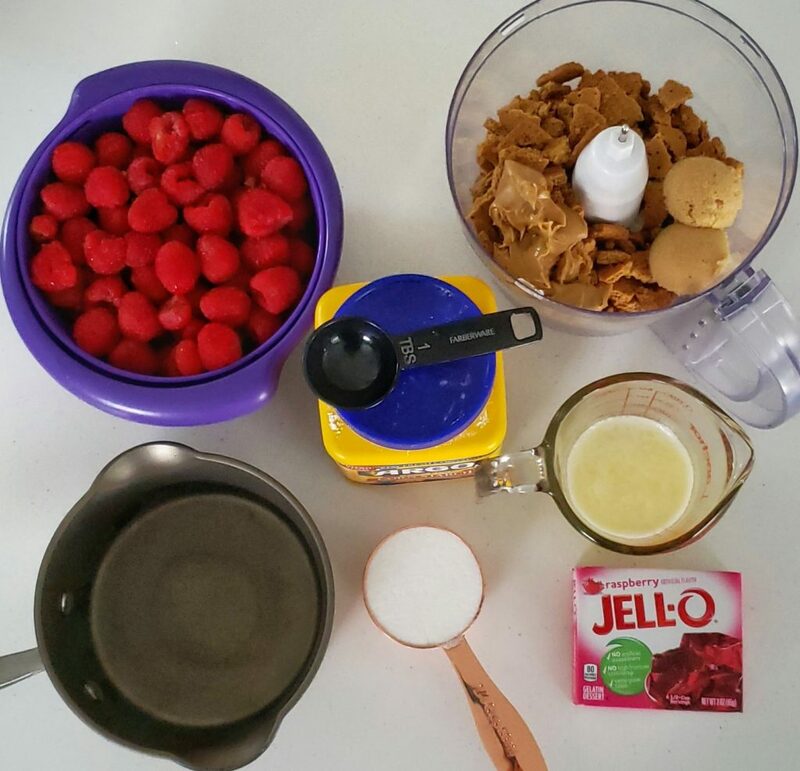 The raspberry filling is jam-like and pairs nicely with the peanut butter graham cracker crust. 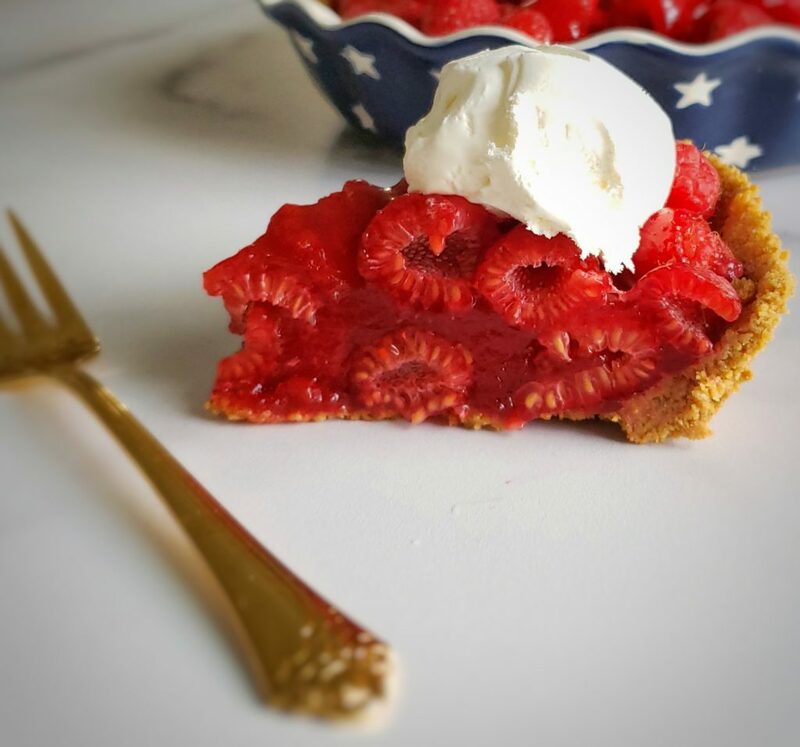 I made this pie as part of my “unusual” flavor combinations week with my Instagram friend @lifeandsprinkles. It turns out raspberry and peanut butter isn’t an unusual pairing, but it was new to me. Several friends commented that this reminded them of a pb&j, and I totally get that! You better believe I’m going to add raspberry jam to my next peanut butter sandwich. Use gluten free graham crackers (I used these) or gluten-full, if that’s your preference. This recipe comes together in no time. Start by rinsing the raspberries and setting them aside to drain. Then start on the crust. 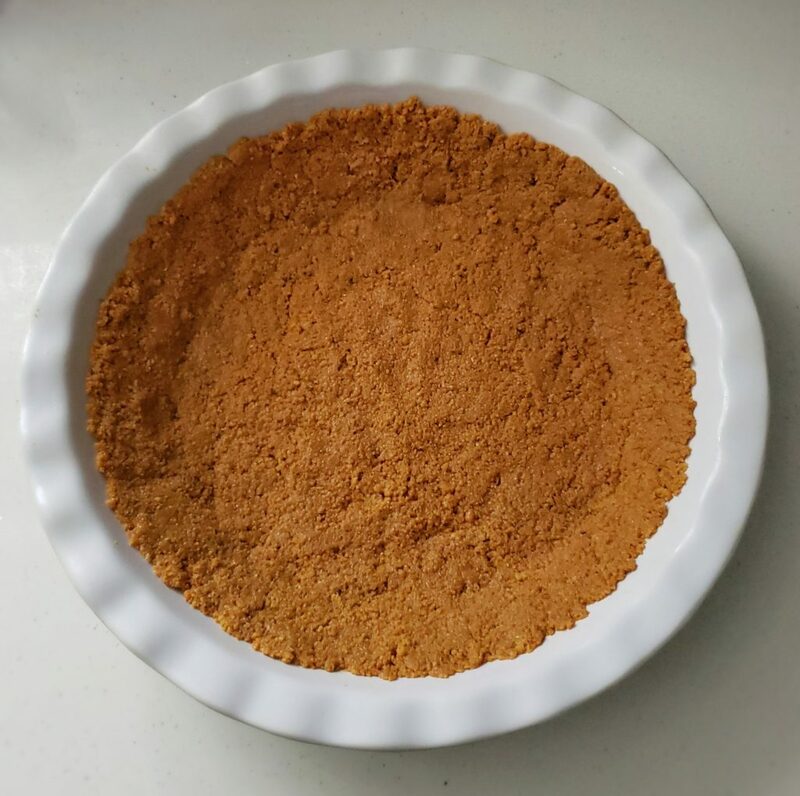 Break graham cracker sheets into small pieces, until you have two cups’ worth. Don’t worry about breaking them into fine crumbs. 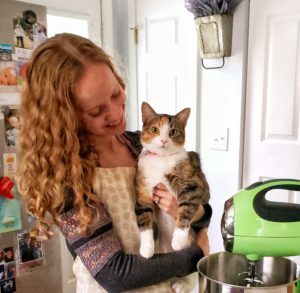 The food processor will do that for you! But if you don’t have a food processor, pour the graham cracker pieces into a ziplock bag and use a rolling pin to break them into finer crumbs. 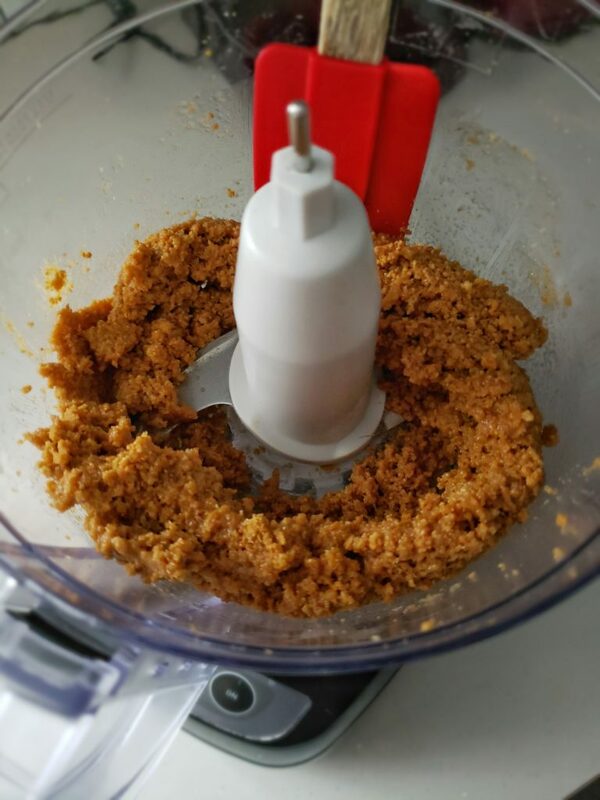 Mix the graham cracker crumbs, peanut butter, brown sugar and melted butter in the food processor. If you don’t have a food processor you can mix everything together by hand. Press the crust firmly and evenly onto the bottom and sides of a pie pan. I’ve found it’s easier if you use your hands. Then stick the crust in the fridge to chill. Prepare the filling while the crust is chilling. (Unintentional rhyme, I swear!) Mix the water, sugar, cornstarch and 1 tablespoon of butter in a medium sauce pan over medium heat, stirring constantly. 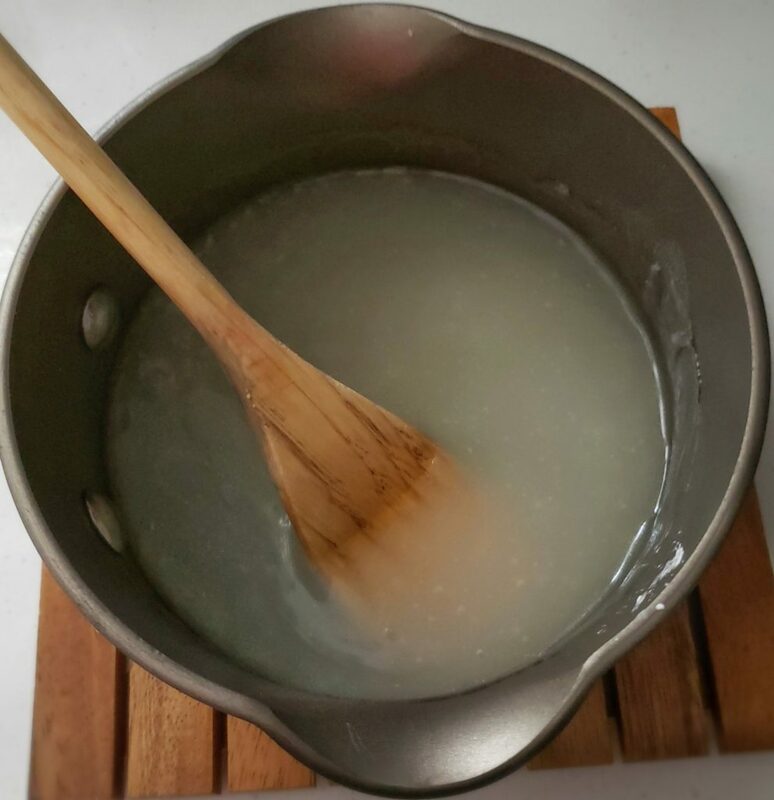 Bring the mixture to a boil, but only after the butter has melted and the sugar has dissolved. Let it boil for 2 minutes (still stirring constantly). Remove it from the heat. The mixture should be thick and cloudy. Mix in the gelatin and let it rest for 15 minutes. 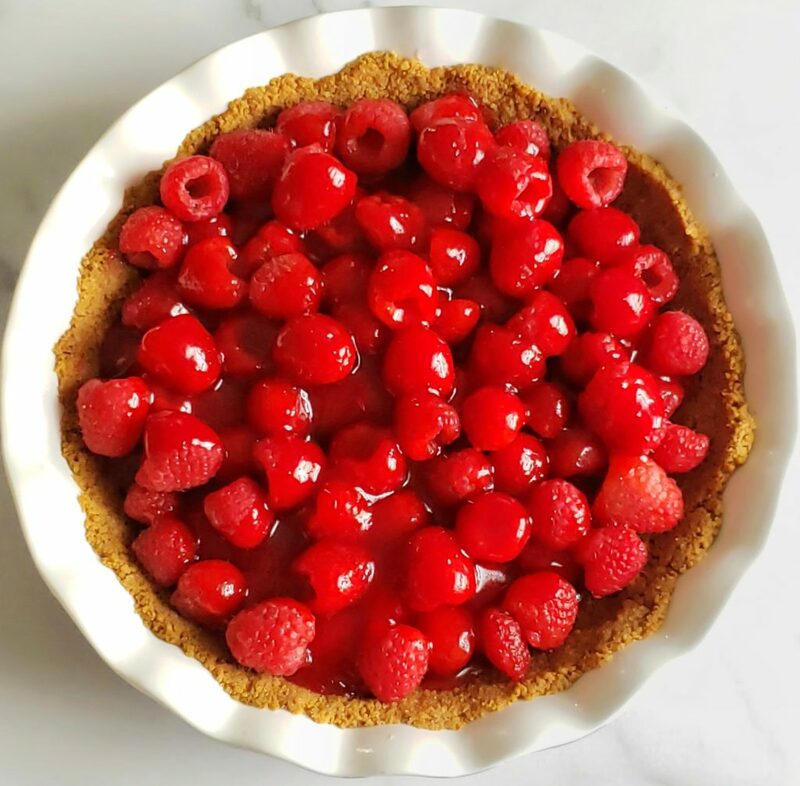 Take the pie out of the fridge and spread the raspberries in the pan. 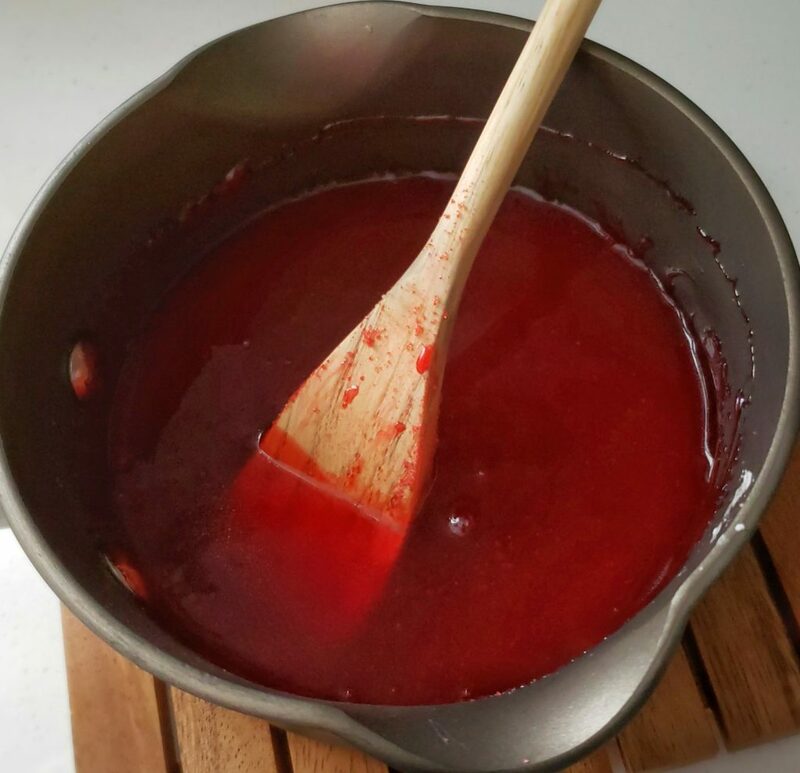 Pour the gelatin mixture evenly on top, and chill the pie for at least 30 minutes before serving. 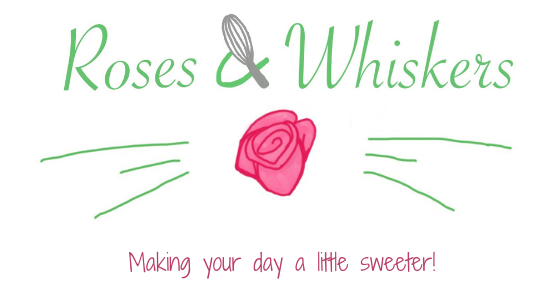 Tag me @rosesandwhiskers on Instagram if you try it, and use the hashtag #rosesandwhiskers. A summery pie reminiscent of the classic peanut butter and jelly sandwich, with a peanut butter graham cracker crust and a sweet and tangy raspberry filling. No bake and gluten free! Rinse the raspberries and set them aside to drain. 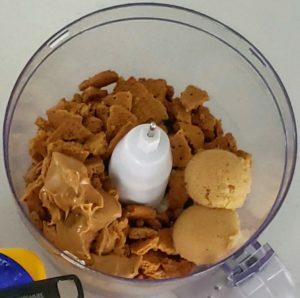 Use a food processor to mix the graham cracker pieces, melted butter, brown sugar and peanut butter. Pulse several times until the graham cracker pieces are finely crumbed and everything is mixed together. Press the crust firmly and evenly onto the bottom and sides of a pie pan. (See the recipe notes.) The crust may not reach all the way up the sides, but that's okay. Put the crust in the refrigerator to chill. Prepare the filling while the crust is chilling. Mix the water, sugar, cornstarch and butter in a medium sauce pan over medium heat, stirring constantly. Allow the butter to melt and the sugar to dissolve before bringing the mixture to a boil. Keep it at a boil for 2 minutes (still stirring constantly) before removing the pan from the heat. The mixture should be thick and cloudy. Stir in the gelatin and then let it rest for 15 minutes. Take the crust out of the fridge. 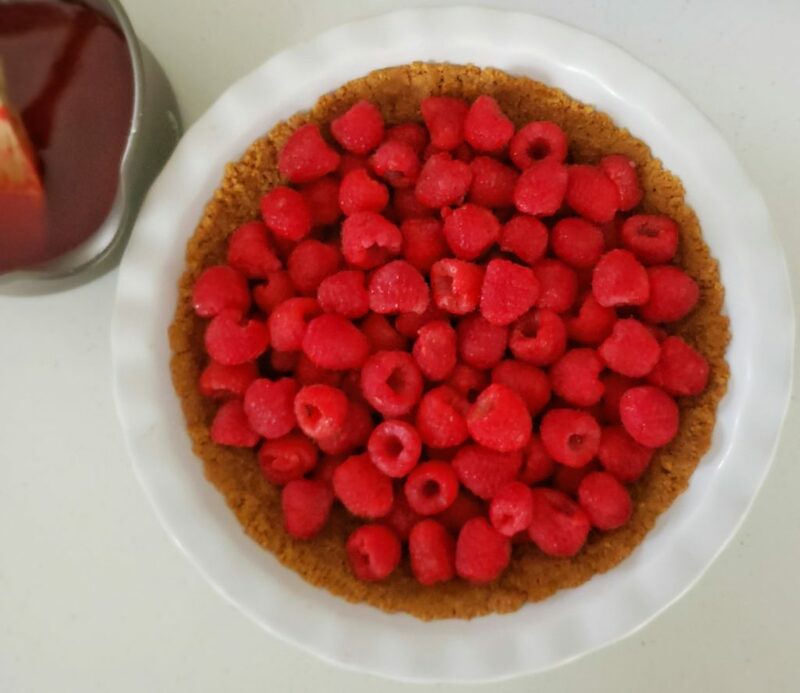 Spread the raspberries in the crust and then pour the gelatin mixture evenly on top. Let the pie chill in the refrigerator for at least 30 minutes before serving. Top with a dollop of whipped cream and enjoy! *I used Schar Cookie Honeygrams and needed 1 box plus a partial box. There are several brands of gluten free graham crackers and some might hold more than others. I'd buy two boxes just to be on the safe side. *It's easier to use your hands (clean, of course!) to press the pie crust into the pan.